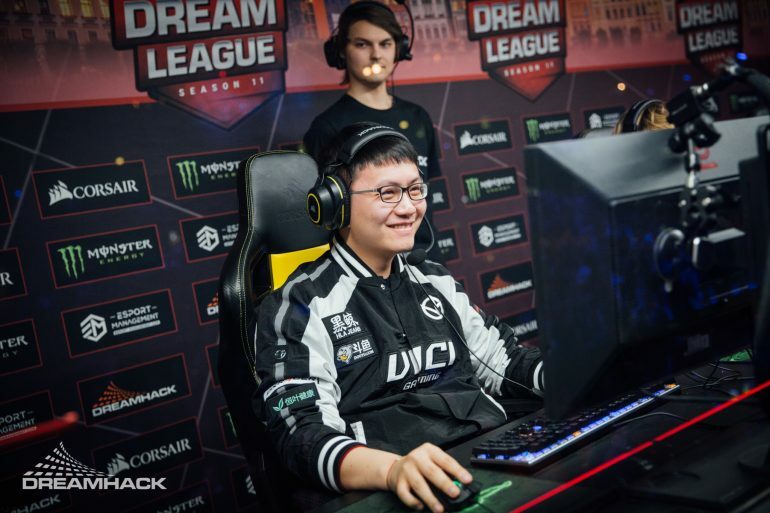 Vici Gaming entered DreamLeague Season 11 as one of the biggest underdogs in the bracket—but now they’ll be fighting for the Major title after an incredible upper bracket run. Throughout the group stage, Vici only dropped one series to Evil Geniuses while they bested Chaos Esports Club and Natus Vincere to take the second playoff spot from their group. From there, the Chinese squad matched up against the top team in the world: Team Secret. It was a close fight, but eventually, Vici came out victorious as they continued to plow through the competition. They next matched up against LGD Gaming, a series that again saw Vici scrape by using some extremely-unorthodox methods. After skating through with 2-1 wins in both series thus far, Vici matched up against a Fnatic team that looked like they were in top form. The first game between the two was a 60-minute contest with no shortage of amazing plays. Neither side was particularly focused on kills, but they were trying to outzone each other—which led to some incredible moments. Fnatic had a much easier time reaching the upper bracket finals, sweeping both Virtus Pro and Keen Gaming in decisive fashion. As they approached one of their final roadblocks, it actually looked like the top team from Southeast Asia would join EG, Secret, and VP at the top of the Dota 2 mountain. Fnatic pulled away late, largely in part to one of their later drafts, a Winter Wyvern for team captain Anucha “Jabz” Jirawong. That, along with a stolen Aegis courtesy of Abed “Abed” Yusop much earlier in the game, was key to their win. Game two was more of the same—Fnatic looked in control early on while Vici tried to battle back. They gained a lot of ground behind a mid push from Zhang “Paparazi” Chengjun who used his Terrorblade to continue a string of good performances, but alone, he wasn’t enough. A lot hinged on Vici’s ability to gain traction outside of teamfights, but it didn’t work out in their favor as they failed to defend a second Aegis assault. This time, Pyo “MP” No-a swooped in to spoil Vici’s plans. Vici somehow managed to pull out the win despite everything that went against them. They closed things out with a great showing in several teamfights. Similar to how they won the last match and their earlier series against Secret, Vici showed that they could take anything their opponent could throw at them and just keep coming. Fnatic had excellent positioning and a chance to push for an early win, but Vici just stood tall and weathered the storm before throwing a vicious counter-punch. Buybacks, combos, and even a few kills weren’t enough to stop the methodical approach Vici kept up. After pulling out the 2-1 victory, Vici are now waiting to see who they’ll face out of the rematch between Fnatic and VP in the lower bracket finals. VP defeated both LGD and Secret to secure their third top three placement of the season.